High durability of being waterproof to 31 m / 102 ft, dustproof, shockproof to 2 m / 6.6 ft, freezeproof to -10 degrees C / 14 degrees F and pressure resistance to 100 kgf / 220 lbf protects the camera under use of almost any severe conditions. The 0.2-inch 1,170K-dot equivalent LVF (Live View Finder) makes it easier to capture subject even under strong sunlight or in backlighting. Records stunningly smooth, high-resolution QFHD 4K video in 3840x2160 at 30p / 25p(50Hz Area) 30p(60Hz Area) or 24p in MP4. Taking advantage of 4K technology, users can enjoy 4K PHOTO to capture those unmissable moments at 30 fps and save in 8-megapixel high resolution photos. Post Focus is also available. Wi-Fi connectivity offers a more flexible shooting experience and instant image sharing with easy operation. A variety of special effects that add fun to shooting experience are integrated in LUMIX TS7 - Creative Control, Creative Panorama, Time Lapse Shot and High Speed Video. For beginners, LUMIX's popular shooting assist function iA (Intelligent Auto) mode helps to shoot beautiful photo/video without mistake. Torch Light function allows the camera to serve as a light with its built-in LED. It also complies with USB power charging. 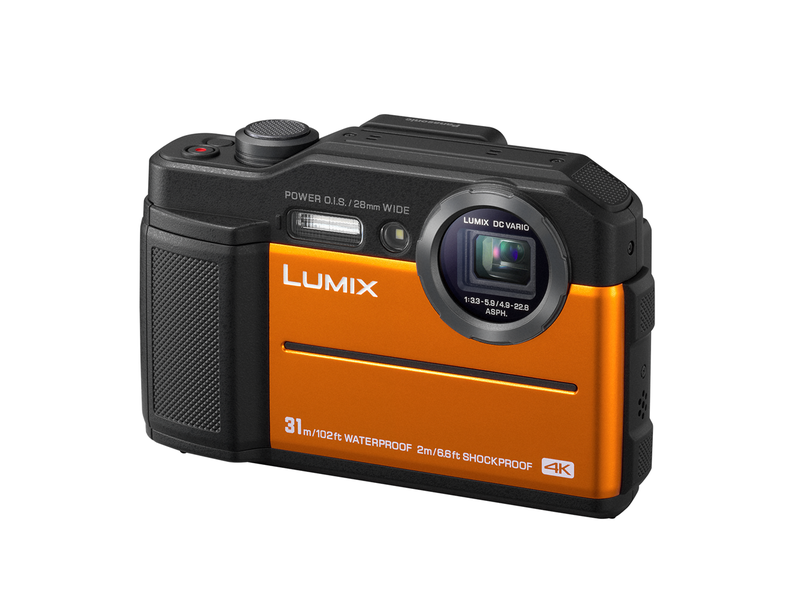 The exciting outdoor adventures - diving, snorkelling, surfing, climbing, skiing, snowboarding - all comes with dynamic motion which is worth being recorded in 4K video or 20-megapixel high resolution photo with LUMIX TS7. The new LUMIX TS7 boasts even more rugged design that enables waterproof to 31 m / 102 ft, dustproof, shockproof to 2 m / 6.6 ft, freezeproof to -10 degrees C / 14 degrees F and pressure resistance to 100 kgf / 220 lbf. Thanks to its minimum apertural area and the rubber padding and reinforced glass inside the camera, the LUMIX TS7 features an airtight body protected against water immersion, dust and sand. Body case is even more thickened to withstand high water pressure of 31m / 102ft. The shockproof allows the camera become droppable from a height up to 2.0m/6.6ft in accordance with the "MIL-STD 810F Method516.5-Shock" test standard. All components including the lens unit are re-examined to endure the temperature as low as -10 degrees C / 14 degrees F.
Not only that, the TS series is the camera specially designed for active outdoor use adopts compass and altimeter. 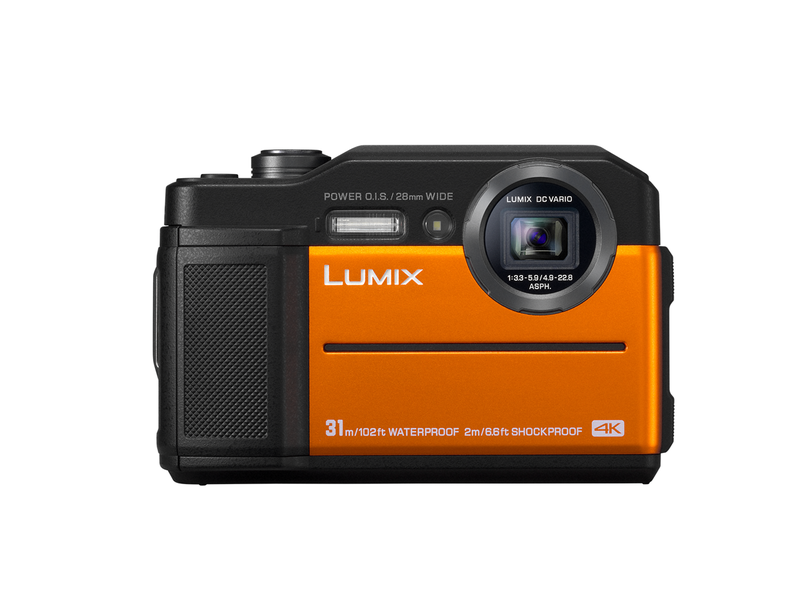 Take out the camera to fishing or camping in the springtime, to diving, snorkelling, surfing in summer, or mountain climbing in autumn and to skiing or snowboarding in winter - The LUMIX TS7 is an all-year-round active field player to record stunning memories in beautiful photo and video. 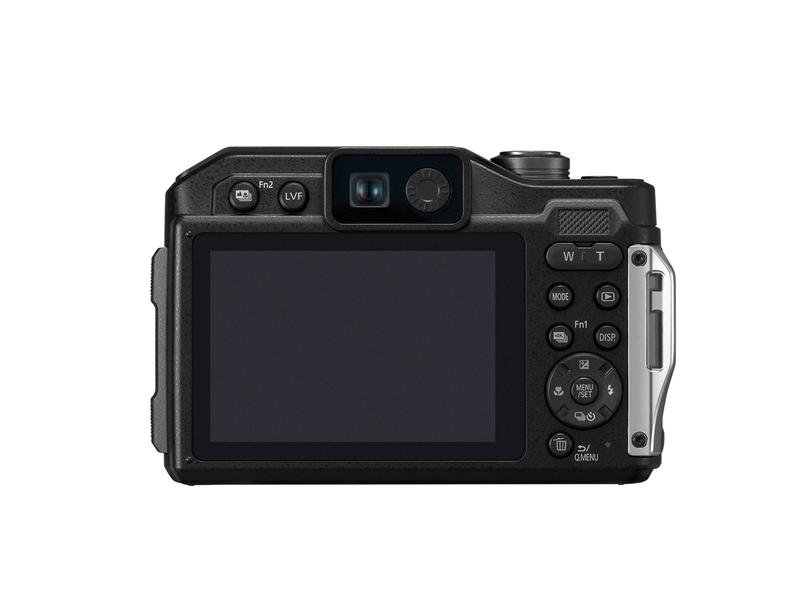 The LUMIX TS7 integrates a new 0.2-inch 1,170K-dot equivalent LVF (Live View Finder). Now it is easier to capture subject even under strong sunlight or in backlighting. Using LVF also saves power consumption to achieve longer battery life in harsh conditions. Both the sensor and the LVF are in 4:3 aspect. The 3.0-inch rear monitor in 3:2 aspect boasts highest-in-class 1,040K-dot resolution featuring approximately 100% field of view. The image output between the LVF and the rear monitor is switched with a dedicated button instantly. Tempered glass is adopted for the cover glass of LCD. The LUMIX TS7 records stunningly smooth, high-resolution QFHD 4K videos in 3840x2160 at 30p or 24p in MP4* in addition to Full-HD 1,920 x 1,080 60p videos in MP4 (MPEG-4 / H.264) format with practical full-time AF. Taking advantage of 4K technology, users can enjoy 4K PHOTO with LUMIX TS7. With the 4K PHOTO, users can capture the fleeting photo opportunities at 30 fps in 8-megapixel equivalent resolution by extracting a frame of the most photogenic timing out of the 4K burst file to save as a photo. Three exclusive functions are integrated to make the 4K photography even easier; 4K Burst Shooting, 4K Burst (Start/Stop) and 4K Pre-burst. The 4K Burst Shooting allows consecutive shooting at 30 fps*, which can be used just like a photo burst shooting. The LUMIX TS7 comes with the Post Focus function that enables users to select in-focus area even after shooting. It is helpful in situations like macro shooting where severe focusing is required or for changing expressions by changing focused subject. The 4.6x optical zoom with POWER O.I.S. is available in video recording, too. The Auto Wind Cut function blocks out most of the noise from background wind. High Speed Video enables recording subject with fast motion in HD (1280x720) at 120 fps / 100 fps, while Time Lapse /Stop Motion Animation are also available. The new LUMIX TS7 integrates 20.4-megapixel High Sensitivity MOS sensor to achieve highest-in-class resolution. The LUMIX TS7 boasts high-speed response to achieve burst shots at 10 fps* in full resolution with mechanical shutter and 5 fps with continuous AF. Autofocusing is fast and accurate with its Light Speed AF. The LUMIX TS7 integrates Wi-Fi connectivity to offer a more flexible shooting experience and instant image sharing with easy operation. 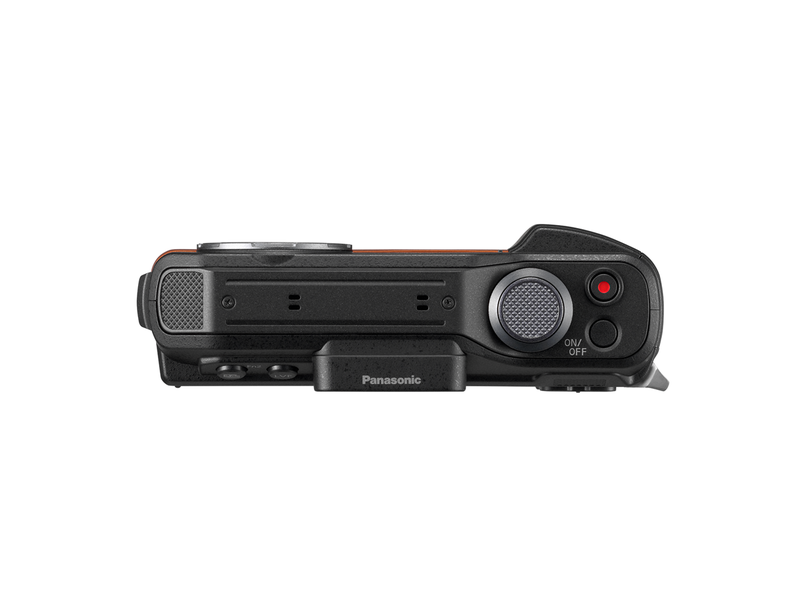 Once the camera is connected to a smartphone or tablet installed with Panasonic's dedicated application software Panasonic Image App for iOS / Android, users can shoot, browse and share images remotely. GPS geotag can also be added on the photos after shooting. The camera's battery can be recharged either via AC or via USB according to the users' convenience. The LUMIX TS7 is equipped with Creative Control featuring a total of 22 filter effects - Expressive, Retro, Old Days, High Key, Low Key, Sepia, Monochrome, Dynamic Monochrome, Rough Monochrome, Silky Monochrome, Impressive Art, High Dynamic, Cross Process, Toy Effect, Toy Pop, Bleach Bypass, Miniature Effect, Soft Focus, Fantasy, Star Filter, One Point Color, and Sunshine. The Creative Control lets users shoot with a filter effect while checking how it makes difference on the picture, which can be used for video recording, too*. With the Creative Panorama function, it is possible to shoot a horizontal / vertical panoramic image with consequent shots taken by overlaying the previous picture and to put on a filter effect of Expressive, Retro, Old Days, High Key, Low Key, Sepia, Monochrome, Dynamic Monochrome, Rough Monochrome, Silky Monochrome, Impressive Art, High Dynamic, Cross Process, Bleach Bypass, Soft Focus, Fantasy, Star Filter and One Point Color. *Some filters cannot be used for video recording. It is possible to turn only light on to light up subject even while camera function is not activated. 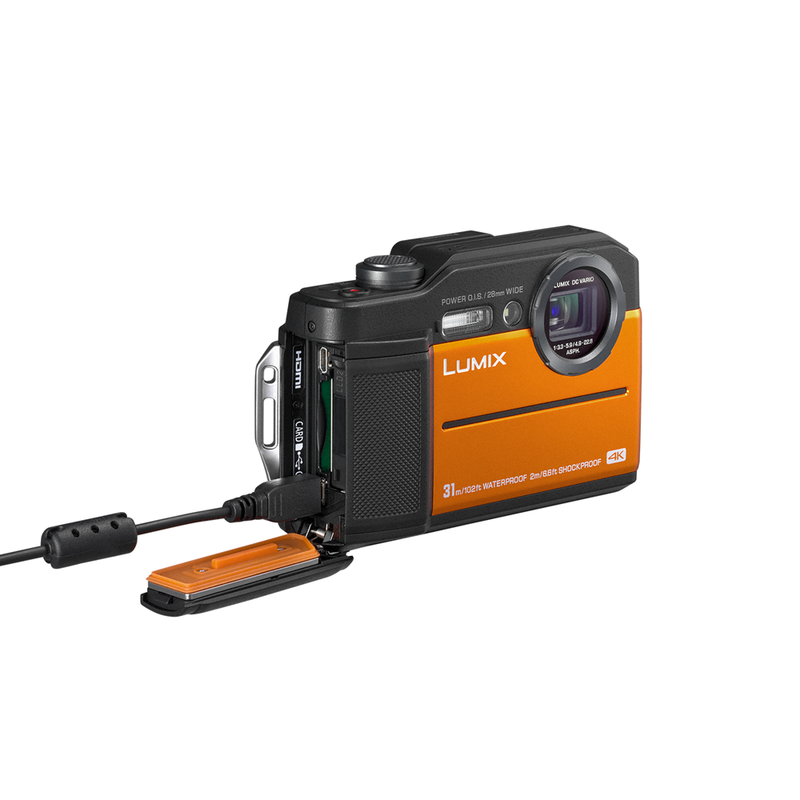 The LUMIX TS7 complies with SDXC UHS-I Memory Card for high speed data recording such as 4K video.